1. 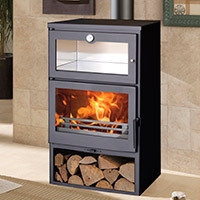 How to properly install a Wood burning stove? The attached diagram details all the necessary steps we need to bear in mind in order to correctly install a wood burning stove/insert (see below). 2. At what distance from the wall or furniture do I have to place the stove? You can find this information on the CE label on the back part of the stove. Depending on the model the distance varies between 40 and 100 cm. It is fundamental to respect this distance for the security of surrounding persons or furniture. 3. How to light up fire in a wood burning stove? Fuel briquettes or other firelighters. Very dry wood logs of weight of 1 kg. We recommend using pine wood; the logs should be cut into wood chips of 20 x 20 mm (the length depends on the stove model). First of all, make sure that the primary air intake is fully open. Secondly, place the fuel briquettes/firelighter in the centre of the grill and light it up. After that put wood chips around the firelighter, leaving space among in order to let the air flows, to start the fire. We recommend not using more than 1 kg of wood chips for lightning up the fire. Only after the wood chips have caught fire we can put wood logs of 1-1,5kg approx. ; preferably oak, olive, beech or birch wood. When the wood logs have caught enough fire, regulate the air flow by closing (till half or even less) the air intake in order to achieve more serene fire. 4. What kind of wood shall I use? Any type of wood you can get according to your geographical situation can be used for the functioning of the machine. The only important thing you have to be aware of is the humidity of the used wood. If the wood logs are too humid or green, it can cause several problems in performance of the stove, due to high water content of the wood. We recommend using oak, olive, beech or birch wood. 5. How much wood do I need to put inside the stove? Every machine is provided with instruction guide, where you can find the recommended amount of wood. This amount may very between 2 and 3kg; it is advisable to not to exceed this amount in order to avoid any irreversible damages of the machine. 6. How to correctly refill the stove with wood? The ideal moment to refill the stove is when the fire is almost extinguished and there are only embers left. You should open the stove door using the oven glove provided and place the wood logs above the embers. 7. Why the smoke is coming out when I open the door? The smoke always tends to come out in the shortest possible way. This is the reason why the smoke comes out when opening the door instead of coming out via smoke outlet tubes. In order to avoid it you should open the door only when there are embers left (there is no fire in the chamber) and refill the stove with wood logs. 8. The stove emits a strong odour while its first use. Is it normal? It is completely normal due the heat-resistant paint we use. During the first services of the stove, the smoke is generated around the stove due to fixation of the paint and evaporation of solvent. We recommend generously ventilate the space where the stove is placed during its first and second usage. Vermiculite is a mineral made of iron or magnesium silicates which is used in the combustion chambers as an isolating element, because of its heat-resistance and light weight. The presence of such material makes our machines more effective and therefore more economical for our clients. This items placed inside of some stoves must not be removed or used as fire starters. 10. How should be the stove cleaned? The cleaning of the stove should be done only when the stove is turned off and there is no chance to get burned. Our machines have ashtray, where the embers and ashes are collected during the combustion. To clean the ashtray, remove it carefully from the stove and dispose the ashes/ambers to a bin (not a plastic one) and place the ashtray back. To properly clean the glass use a cotton cloth and glass cleaner to remove any dust or ashes generated during combustion.